The possibilities and rewards are bigger when designing with Alleanza Quartz! ELIGIBLE K&B RETAILERS ONLY– Rewards are only eligible to Kitchen and Bath retailers who are part of our Alliance. Fabricators and Distribution Centers with showrooms do not qualify for this program. ELIGIBLE RESIDENTIAL JOBS ONLY– Only individual residences are eligible for K&B Rewards. Commercial projects including but not limited to restaurants, showrooms, multi-unit residential, offices, etc. are not eligible for K&B Rewards. VALID ONLY FOR FABRICATED AND INSTALLED RESIDENTIAL JOBS– The payout is based on the amount of slabs purchased, fabricated and completely installed. K&B FINAL INVOICE FROM FABRICATOR– Invoice serves as proof that Alleanza Quartz was sold and installed, as well as should list the total number of slabs used for the project. FLOOR PLAN OF JOB– Floor plan should indicate where Alleanza Quartz was used, showing dimensions and total square footage. W-9 FORM– A W-9 should be completed with all information and submitted only once. Rewards are paid to participating K&B retailers or their relevant employees. Taxes are the sole responsibility of the K&B or its employee. Rewards will be mailed to the address provided by the K&B retailer or its employee, per the W-9. K&B rewards must be submitted within four (4) weeks of the fabricators final invoice date. Qualifying rewards will be paid out within eight (8) weeks of the submission date (providing there are no errors in the submission form). Please double check your W-9 forms for accuracy, prior to submission. NOT REGISTERED FOR AQ REWARDS? EGM reserves the right to modify program and/or rules, to correct typographical errors, or terminate the program at any time at the company’s discretion. Special Double Spiff Offer ends May 31st, 2019. Program cannot be combined with other offers and is void where prohibited. Valid only in NY, NJ, and PA.
All required information must be submitted to be eligible for rewards. Submissions will be reviewed and paid out within 12 weeks of submission date. Individual residential projects only are eligible for rewards. Commercial projects including multi-unit residential are not eligible. 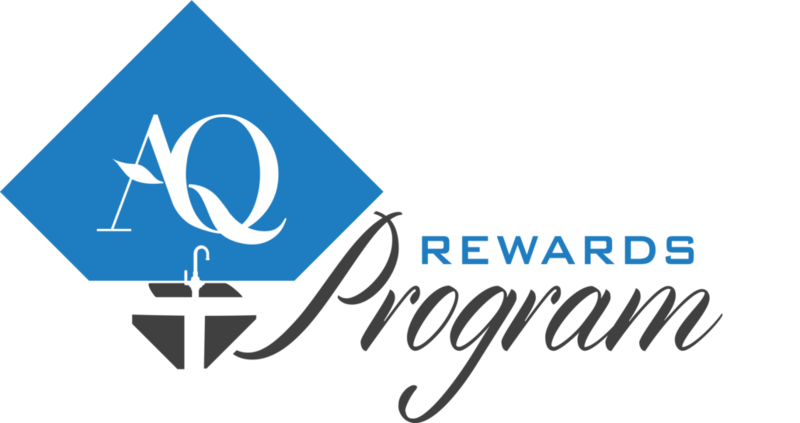 The AQ Rewards Program is exclusively for Kitchen & Bath Dealers.